Whether it’s Melania, Bill or Michelle, the other halves of America’s bruising presidential campaign have regularly been called upon to defend their embattled partners. Nigeria’s president is probably wishing his wife had kept quiet. 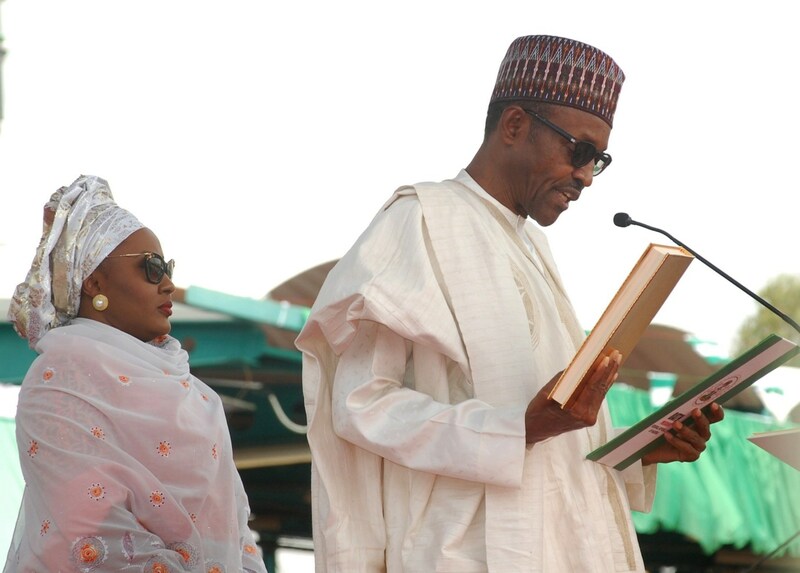 President Muhammadu Buhari takes his oath of office with his wife Aisha Buhari during his inauguration ceremony in Abuja, Nigeria, in May 2015. The president won a historic victory in 2015 after campaigning on a platform to stamp out Nigeria’s endemic corruption problem. But on Friday, the first lady suggested that her husband’s administration had been hijacked and that he was not in control of appointing his own officials. She said that these officials had been “sitting down in their homes folding their arms, only for them to be called to come and head an agency or a ministerial position” in Buhari’s government. Buhari, who will be 76 at the next election, responded to his wife’s comments during a news conference while visiting Germany. At 45, Aisha Buhari was just a teenager when her husband became Nigeria’s leader for the first time, ruling as a dictator between 1983 and 1985. But low oil prices have plunged Africa’s biggest producer into a recession.